Photo mosaic software » direct, easy & without download! Creating your own photo mosaic couldn’t be easier. Unfortunately there is no mosaic program that could be recommended as software for Mac – the Edda mosaic software is not available for Mac. But these days it’s very simply to create photo mosaics online. Here’s how you can make a photo out of photos on your Mac & pc in just a few easy steps. To make a photo mosaic on your Mac or pc, all you have to do is upload the desired number of photos directly online. The Apple browser Safari is suitable for this purpose, for example. Once your photos have been uploaded into our photo mosaic software, we create your mosaic for you within one day. The finished mosaic pictures can then be printed on your desired material. Making a photo mosaic is easy these days with photo mosaic software. There are various mosaic programs on the market that are suitable for varying requirements. Generally speaking, there are two types of mosaic photo software. One of these is the mosaic program that is downloaded and installed on your PC and the other is online software that can be used directly online. The free mosaic program from photo-mosaic.co.uk is in the latter group. Both types of software have advantages and disadvantages, as explained below in more detail. The advantages of a mosaic photo software that is available online is obvious: you don’t have to buy any mosaic software and you don’t have to install any software. 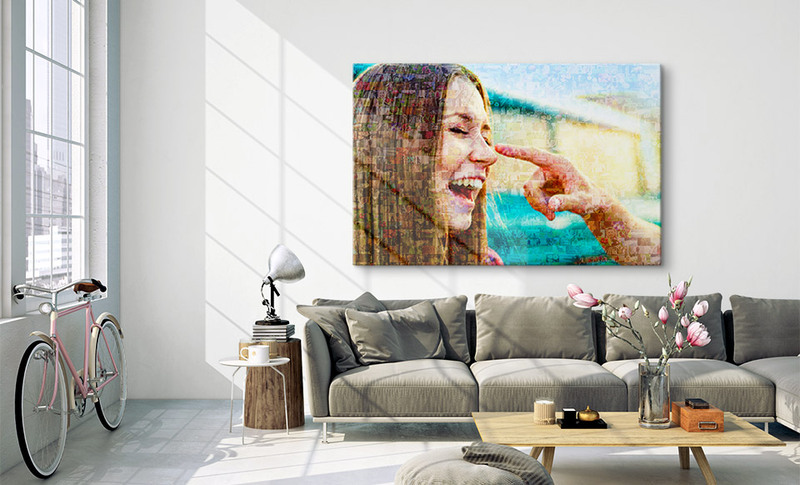 You’ll only have to pay if you want to have the resulting photo mosaic printed in a large format. Creating your photo mosaic online is always free of charge. In addition, digital photo montage software, like that from photo-mosaic.co.uk, is very easy to use. Creating your own photo mosaic project will take just a few minutes. 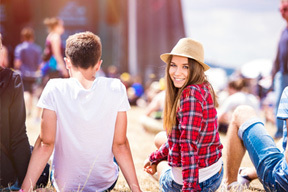 The only prerequisite is a good internet connection for the uploading of the photos. In contrast to mosaic picture software for the PC, online mosaic software can be less sophisticated. Moreover, you will need an internet connection because the many photos for the mosaic must be uploaded. However, photo-mosaic.co.uk – just like desktop-based software – also offers the option of editing the photos. This allows you to turn, trim or colour your photos. If you only plan to make a photo mosaic once, you can do this quickly and simply with online mosaic software. Before internet connection became so high-performance that uploading thousands of photos no longer took forever, there were already excellent mosaic programs for the PC. Several manufacturers brought high-performance mosaic programs on to the market. 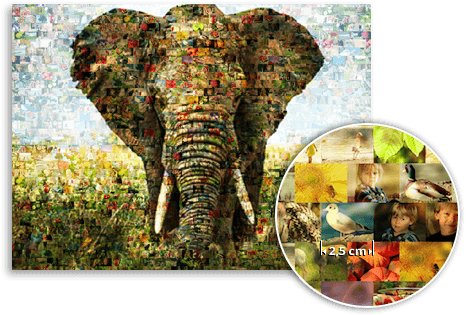 This mosaic picture software can have an impressive range of features. These mosaic programs are still considerably more sophisticated than online software: the mosaics a created directly in the photo mosaic program and can be recreated and edited over and over without loss of time. 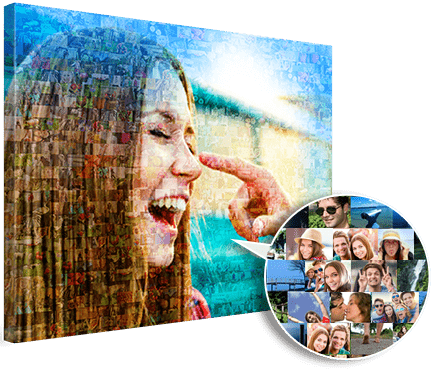 In the case of online photo mosaic software, the creation of a photo mosaic usually takes several hours up to several days – too long when you want to seriously experiment with the topic of photo mosaics. In addition, the PC version of mosaic picture programs generally produce a motif-related, colour-arranged mosaic, whereas online image mosaic software works with a transparent layer algorithm. The creation of the colour-arrange photo mosaic requires much more computing power, many more photos and is thus better placed on the PC. But this scope of function also has its (justified) price. Most mosaic picture programs for PC are not freeware – rather they are generally offered as fee-based shareware. They can be downloaded from various software platforms. As is always the case when it comes to software, there are considerably more mosaic editor programs for PC than there are for Mac. The Edda mosaic software is probably the leading mosaic program on the market. The software has a comprehensive range of functions and is easy to use. First upload the main image for your mosaic – this will be the large image of your software mosaic. Now upload the many small pictures – more pictures give a better result. And now we create your mosaic for you. We’ll need around 24 hours for this. Now you can order your software mosaic. Delivery will take 1-3 days.